Take your shot at big cash prizes. It's time to make every single play have the same excitement level as a buzzer beater with DraftKings daily fantasy basketball. It’s as easy as drafting a lineup of eight hoops stars while staying within the salary cap. When they make plays on the court — things like points, assists, rebounds, and more — you rack up fantasy points. Score enough and you’ll bring home the bacon — even if you don’t finish in first. When tomorrow comes, you can draft a whole new team from a whole new set of games. So, get on the hardwood and play DraftKings daily fantasy basketball for free. 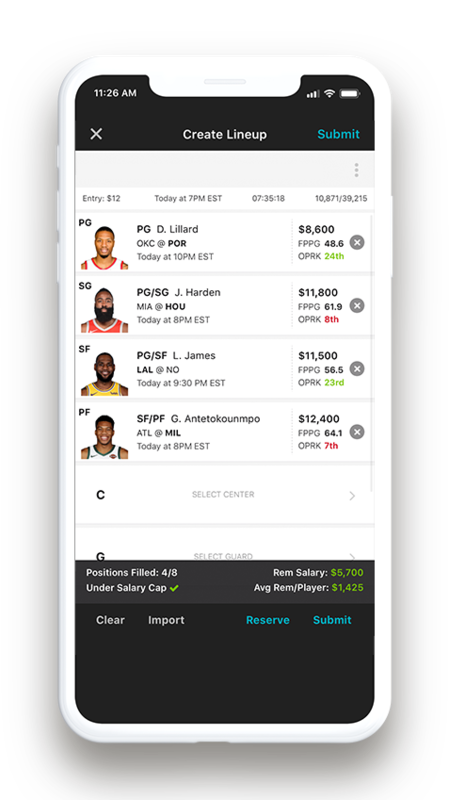 It's easy to play DraftKings daily fantasy basketball. Pick a daily fantasy basketball contest and draft from the game’s biggest stars. Drop huge points to win cash. Draft a new lineup every single day. Pick from your favorite hoops players. Pick from leftover players and deal with injuries and draft day busts. Wait until the end of the season for a cash prize. Reasons you should play daily fantasy basketball. Draft a new squad whenever you want. Makes every play — from the opening jump to the final buzzer — more exciting. Play daily fantasy basketball contests for as little or as much as you want. There’s a daily fantasy basketball contest for everyone — you can even play free. Scoring is based on how your players do on the court. Learn more about fantasy basketball scoring.